Stem cell therapy gave Pam Hayes relief from pain in her knees that she had suffered practically her entire life. She can get out of bed, out of a chair, and move around much better now. At the Stem Center of Georgia at Ageless Wellness Center in Peachtree City, painful knees may be treated without the use of surgery or pharmaceuticals. Pam Hayes had suffered with bad knees practically her entire life. At just the tender age of 3, she underwent her first knee surgery to repair torn cartilage. By fifth grade, she’d been diagnosed with rheumatoid arthritis. Then in 2011, while in her early 40s, she had surgery for another tear with free-floating tissue that had torn away from the joint. 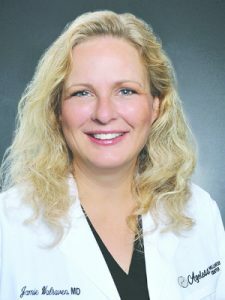 A friend works at the Stem Center of Georgia at Ageless Wellness Center in Peachtree City, where Dr. Jamie Walraven specializes in treating degenerative, inflammatory and, autoimmune diseases without the use of surgery or pharmaceuticals. She thought Hayes was a good candidate for stem cell therapy on her knees. “I was willing to give anything a shot, and so I did,” she admits. The two-hour drive from her home in Augusta to Ageless Wellness in Peachtree City ended up being well worth the trip. As Hayes explains, the stem cell therapy involved a mini-liposuction in which a syringe of fat was taken from her belly, which then gets spun down and processed into concentrated stem cells. “They even let me look at my stem cells through a microscope, which was pretty neat,” she laughs. Hayes then received injections of her own stem cells into both knees. She also received an infusion of stem cells through an IV that showered her whole body. Hayes knew ahead of time that the results are not instantaneous. It takes several months for the regeneration of new cartilage. But within a year, she absolutely knew that her knees were getting better. “Before the stem cell therapy, I felt like an old lady,” Hayes says. “The toilets in my home were so low that I felt like I needed a booster seat because my knees were so bad. I couldn’t go to a restaurant and sit for long periods of time, or go to a bar and have a cocktail and get down off the barstool. “But those things changed. I started to see that my knees were getting better. In the morning I would wake up, put my feet on the floor and be ready to get my day started, whereas before I could barely get out of bed. As art director for an Augusta-area marketing agency, Hayes says she spends hours sitting in front of a computer. “If I could get one more treatment, it would be the equivalent of having brand new knees,’ she says. “I’ve absolutely considered doing it a second time.” That confidence has made Hayes an advocate for others considering stem cell therapy. “With Pam, her rheumatoid arthritis was in remission, so her treatment helped the damage that was done. For people in active rheumatoid arthritis, our focus would be not only in managing the joint, but also the autoimmune process,” said Dr. Jamie Walraven, medical director at Ageless Wellness.